The Red Wings are currently a glass half-full, glass half-empty proposition. The glass half-empty: The Red Wings have lost an inordinate number of man games to injury. Also, they been remarkably inconsistent, literally from period-to-period, let alone game-to-game. In the process, they are letting points get away here and there, which ultimately could prove to be painful. 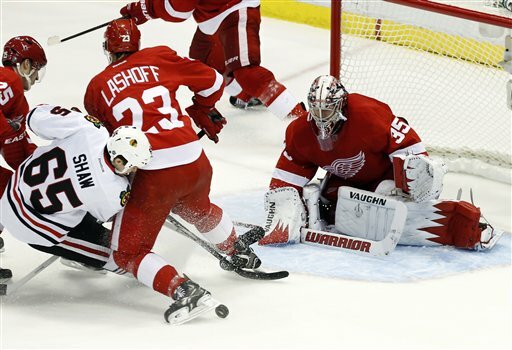 Sunday's shootout loss to the Blackhawks was typical of the Red Wings' season. They broke a scoreless tie against the NHL's best team with a goal by Tatar in the third period set up by Andersson from behind the net. They lost the lead. Defenseman Jonathan Ericsson, who has developed in a solid NHL defenseman after years of getting blistered by Red Wings' fans for being a turnover machine, shot the puck over the glass for an automatic penalty. Then, Patrick Kane, Chicago's superbly skilled center, took over the game with a pretty one-timer tying goal and a sensational clinching move in the overtime shootout. Ah, the Red Wings got a point. Glass half-full. Ah, Red Wings flittered away a point they should have gotten. Glass half-empty. Glass half-full: If the season ended today, the Red Wings would be in the playoffs. Glass half-empty: Yeah, but they have 24 points, and so do five other teams in the Western Conference. In fact, the Western Conference is extraordinary balanced. It's rapidly approaching the halfway point of the NHL's lockout shortened schedule of 48 games (the Red Wings have played 22), and 12 teams have between 26 and 20 points in the Western Conference. So when the Red Wings let a late lead get away and lose at Los Angeles. Or if they lose twice at home to dreadful Columbus. Or if they get a point when they probably should have had two against Chicago, it's something that could eventually put their spot in the playoffs in jeopardy. Fourteen of the Red Wings' last 22 games are on the road.